It’s Valentine’s Day. So, in honour of such, I wanted to post about some recent discussions and debate surrounding the biblical first Valentine’s couple, Adam & Eve. They were the first lovers. If you aren’t aware, there is a lot going on in both the book and blogosphere world discussing the literal historicity of Adam (and, by association, Eve). Actually, this has been going on for some 150-200 years, but has moved into the more popular arena of theology in recent years. Last week, neo-reformed pastor and theologian, Kevin DeYoung, posted 10 Reasons to Believe in a Historical Adam. My evaluation is that DeYoung was more “preaching to the choir” rather than addressing the central hermeneutical and origins issues related to the discussion. In response, Dr James McGrath quickly posted Ten Really Bad Reasons to Believe in a Historical Adam. It was a little more edgy than Peter Enns’ more benevolent response posted yesterday, Thoughts on Kevin DeYoung’s Restless Comments on the Historical Adam. But both are worth a read in underlining the inability of DeYoung, and others, in faithfully addressing some of the more necessary hermeneutical and origins questions that arise. More than anything, I think books like Peter Enns’ Inspiration and Incarnation and The Evolution of Adam really get down to the meat of the issues. The first I read a few years back and reviewed in part 1 and part 2. The second I am currently reading and hope to post a review in the coming weeks. There are other books and articles, like the current dialogue going on at Jesus Creed as they discuss Enns’ recent title, The Evolution of Adam, or the specific one-post response. But those 2 books above are a good place to start. We have to face issues – scientifically, culturally and theologically – that our fathers did not have to in generations and centuries before. We have an opportunity to wisely and graciously engage with affairs of our day, all to the glory of God and testimony to the truth of the good news in Jesus Christ. Also, if interested, below is a short video with N.T. Wright briefly sharing some thoughts on a theology of Adam & Eve. 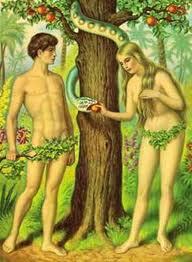 This entry was tagged Adam and Eve, Genesis, James McGrath, Kevin DeYoung, N.T. Wright, origins, Peter Enns, science. Bookmark the permalink. I’m really surprised there is any debate on this topic. The story of Adam and Eve as recorded in scripture shows us that God’s plan was always one of redemption from the beginning. To deny or even water down that story weakens the veracity of that information, which throws a monkey wrench into the whole plan of redemption. Why would any Christian DO that? God told Moses what happened and he wrote it down. That’s good enough for me. I think what people are trying to do in today’s world is be faithful to our Lord and his intent in Scripture, but also recognise developments in the arenas of history, archaeology, the sciences, etc. I don’t think we need to pit the 2 against one another – faith and science. We need to allow our good God to speak through his good creation. We don’t worship it (just as we don’t worship Scripture itself, but the one it tells us about), but we allow God’s voice to come forth.